Jenny from Hank and Hunt made this cute Christmas garland by wrapping empty raisin boxes to look like Christmas presents. She even has a tutorial to show you how to make mini boxes out of empty cereal boxes too. This cute mini present garland is a fun Christmas decoration, but you can also use it for a birthday party if you switch out the red and green wrapping paper. 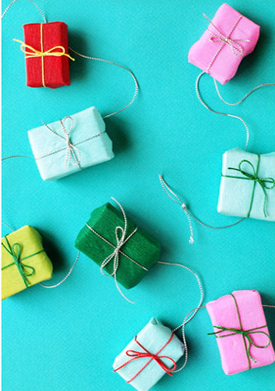 You can see the DIY Mini Present Garland tutorial over at Oh Happy Day.